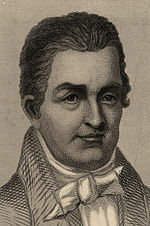 In 1819 while in New York City Oliver Evans was informed that his workshop in Philadelphia had burned to the ground. He was granted a patent for a steam-carriage design in 1789 but did not produce a working example of such a machine until over a decade later (see below on his Oruktor Amphibolos). (His design was modified by Jacob Perkins who obtained the first patent for a refrigerating machine in 1834. He produced an improved high-pressure steam engine in 1801.